It’s no secret that dinosaurs and Jurassic Park are a huge part of my life. I have always loved the movies for so convincingly bringing to life these “leviathans of ancient history” (in the words of Steven Spielberg), on a level that no other movie has matched. Suspension of disbelief came all the easier when you could believe the dinosaurs were there. Rather than merely watching a dinosaur chase a character around, you felt as if you were truly face-to-face with creatures both beautiful and terrifying. One of the most powerful ways the makers of Jurassic Park accomplished such a task was to painstakingly build animatronic dinosaurs that could move and blink, and actually be there on-set, so the actors’ performances would be all the more convincing. They had more to act with than a green screen or tennis ball. CGI was generally reserved for shots that couldn’t be obtained with a robot or puppet. 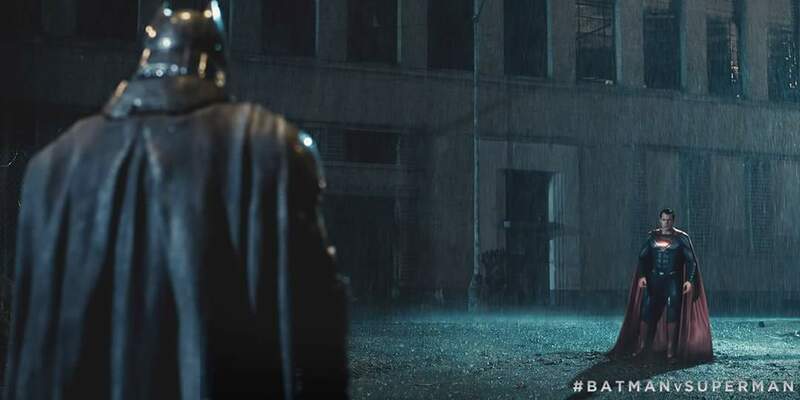 And it forced the CGI crew to make their contributions photorealistic, because they had a life-sized reference on the set to guide their creative process. As a direct result of this marriage between computers and physical effects, the Jurassic Park series has given us some of the most magical and thrilling moments in movie history. The T. rex’s escape and the ailing Triceratops in the first movie, Sarah Harding petting a baby Stegosaurus in The Lost World, the Pteranodon attack in Jurassic Park III. For those of you who have seen Jurassic World: didn’t the scene with the dying Apatosaurus get to you on some level the other scenes didn’t? I admit, I shed tears during that scene, and still get choked up watching it. I believe that scene so much more than the CGI Velociraptors (which are admittedly quite well done). You actually feel something for this gentle giant, mauled to death by the Indominus Rex. As the success of this scene and Mad Max: Fury Road proved this year (to say nothing of the crazy excitement for practical effects in Star Wars Episode VII: The Force Awakens), audiences still have an obvious passion for practical effects, if only the movie’s creators and company allow them to be used. Someone in Hollywood has to finally be taking notice that we’re getting tired of the over-reliance on computers that lessened the impact and suspension of disbelief in Avengers and the Hobbit Trilogy. So I write this post as a plea to those who can make the decisions for the next Jurassic sequels. I ask of you, please keep the magic alive. Help us, as an audience, suspend disbelief. Please keep practical effects, for more than one scene or one dinosaur. The effects crews – and audiences the world over – will thank you, and you’ll give us more of those cinematic moments we’ll never forget. Okay, now to dive into this topic once more. This will be the last post I do on this topic for a while, and I apologize for its considerable word count. There was a lot of ground to cover. But at last, here is section B. More criticisms answered. I welcome feedback, whether positive or negative. You can find part one here, part two here, and part three-A here. Skeptics tend to say the Mokele-mbembe is just a legend, with inconsistent descriptions pieced together from sightings (or cultural memories, if the animal no longer lives in the area) of rhinos, elephants, giant snakes, and even giraffes. When interviewing people who claim to have actually seen the creature, there is a huge spike in the consistency of their descriptions. They describe a creature at least the size of a hippopotamus, with a bulbous body, long neck and tail, and small head. It attacks hippos but is an herbivore, and has dark, dull coloration, sometimes with dermal spines (the Cameroonian natives confidently stated that the spines are only on the male, but that females are bigger and have longer necks). The larger, more mature specimens are described as having hard armor, akin to the armor of crocodilians and possessed by several species of sauropods. To keep the inconsistency charge afloat, the skeptic must resort to a comparatively small number of instances, such as a group of pygmies referring to a picture of a rhinoceros as Mokele-mbembe (included in National Geographic’s special Congo issue from several years back), or a witch doctor describing it as a river spirit that can take any shape or size in Rory Nugent’s “Drums Along the Congo.” There are others besides these, but once again the consistent descriptions far outnumber the inconsistent. What goes all but ignored are the descriptions by those who, again, claim to have seen the animal with their own eyes. The most prominent inconsistencies seem to come from two sources. First, natives from the wrong parts of the Congo Basin who have heard rumors of the animal but don’t claim to have seen it. Second, from skeptics conflating the long-necked creature with another unknown beast, the rhino-like Emela-ntouka. The latter would assume the animals are overlapping versions of the same myth rather than allow the possibility of not one, but two unknown large animals. The natives themselves (that is, those who claim to have seen Mokele-mbembe) have no trouble making a distinction between a long-necked creature and one that resembles a rhinoceros. As far as I know, they have always treated these two animals as separate, instead of one mystery animal whose appearance morphs in the spreading of rumors. This objection carries very little argumentative power, for two reasons. First, most natives of the Congo hold animistic beliefs, where everything has spiritual significance and often is imbued with supernatural abilities. Including known animals, from hornbills to hippos. Animism grants everything some kind of spiritual dimension, myth and reality alike. Second, the various tribes of pygmies have differing attitudes toward Mokele-mbembe. Some of them indeed regard the creature as something with spiritual or godlike powers that set it aside from all other creatures. Others, especially the Baka tribe in Cameroon, just consider it a rare animal which they’d rather not encounter, thanks to its tendency to attack canoes and disturb their fishing. Dangerous, to be certain, but no more a boogeyman than a temperamental rhino or an angry bull elephant. I must admit, this is the strongest and most thought-provoking objection I’ve heard. Thus it demands to be seriously considered, and treated with a sober mind. Whether these expeditions would “surely” have discovered this animal rather depends on the quality and duration of the expeditions. There have indeed been many trips, but a sizeable portion have invested their time primarily in gathering eyewitness testimonies instead of searching for the creature itself, and the vast majority of expeditions have been anything but well-equipped. Even in their searches, almost every expedition has been “looking” for a rare, reclusive animal like a fisherman “looking” for fish without bait. To my knowledge, no one has even tried luring it or searching over a wide area. Frustrating to be sure, but this isn’t always the fault of the people leading these trips. If your expedition intends to investigate something that initially sounds far-fetched, such as a dinosaur-like animal hiding in the rainforest, good luck obtaining some grant money or well-funded investors. Going to the region usually means you need to pay expenses out-of-pocket. When you have to finance it yourself, the proper equipment that accompanies conservationist/observational expeditions can thin your wallet at an alarming rate. And what equipment you can gather might prove inadequate. Another important fact is that governments of the target countries — People’s Republic of the Congo, Democratic Republic of the Congo, Gabon, and Cameroon — are infamous for being corrupt and hardly caring about Western explorers stomping around their jungles. Bureaucracy and infuriating, pointless waiting periods are a burdensome fact of life for anyone involved with those governments (even more so than in America, if that can be believed). Even when expeditions actually make it to the country, it can take weeks to get a visa signed. I recommend once again the books in the bibliography below to see for yourself. When a visa is finally signed, normally it’s very limited in the time allowed. This leaves most expeditions a couple of days or weeks to go poking around the jungle and interviewing natives, hoping to find anything of consequence. Skeptics tend to point at the lack of solid evidence despite numerous expeditions, and say this doesn’t bode well for Mokele-Mbembe as a real animal. Then they will turn right around and note (correctly) that many of the people searching for it had little to no prior field experience in tracking animals. Additionally, on p. 287 of “Abominable Science,” skeptics Loxton and Prothero rightly note that many of these expeditions to the Congo “do little more than arrive and turn around.” The very next paragraph features them gloating that more expeditions have yielded far less evidence of Mokele-mbembe’s existence, despite their acknowledgement that the trips are not long-term and are seldom as thorough as they could have been. Do I have to spell it out? If most of these visitors to the Congo were not qualified to look for rare animals in inaccessible environments (especially in so hostile an environment as the Congo), and often manage to accomplish little more than arriving and returning home, should we be surprised that physical proof has not been gathered? By the way, about that last link above: remember the gorillas I mentioned earlier in this series? It’s hard to overestimate the ecological impact 125,000 gorillas will have on an ecosystem. And yet the Congo is to this day so dense and so unexplored, we had no idea these extra primates existed until 2007. It’s not that biologists aren’t doing their jobs. It’s just that the Congo is still, in ecological terms, a largely blank space on the map. It is true that the human mind can be tricked into remembering details that were not present, and misidentify known creatures for unknown ones. But the charge of misidentification is a weak one, for (as Robert Mullin has pointed out) the natives are quite familiar with the animals around them. They are dependent on local nature to a greater extent than we tend to be in the West. Their very lives depend on quick wits and keen observation, and identifying the animals and plants they share the jungle with. The jungle is their grocery store, their home, their pharmacy; and the river is their highway system. The natives are quick to take offense if you try telling them they misidentified an animal (it’s one of the fastest ways to insult them), and for good reason: these same hunters and fishermen know very well what a swimming snake or elephant looks like, for they have seen it hundreds of times before, and they state emphatically that they caught sight of something very different. Once again, I’d also love to know how separate tribes can semi-hallucinate imaginary water beasts with the same morphology, over and over and over again. I’ve wanted to tackle this for a while, and there’s multiple arguments I will bring under this umbrella. Keep in mind, I didn’t go to the trouble of writing these blog posts to argue for extant dinosaurs; only for the likelihood of an unknown species. But once again, I found the skeptic’s case leaves much to be desired in this line of thought, and that’s putting it charitably. For the heck of it, I’ll pick these arguments apart as well. This last part will focus on the specific objections against a dinosaurian identity for Mokele-mbembe. I’ll leave other possible candidates aside for this section, such as giant turtles, amphibians, or long-necked monitor lizards. a. No dinosaur fossils occur after the Cretaceous extinction. A large animal may take longer to decay, which some say makes them more likely to be fossilized, that is still not enough. If it lives in an environment where carcasses decompose rapidly (like, say, a rain forest), why expect any fossil record at all? And by the way, the fossil record’s seeming dearth of dinosaur fossils post-Cretaceous notwithstanding, dinosaurs were extremely varied. I’m not convinced even a comet impact could take them all out. Exactly how plausible is it to presume that every single sauropod, tyrannosaur, ceratopsian, ankylosaur, hadrosaur, ornithomimosaur, etc. went immediately extinct at the end of the Cretaceous, but creatures far more sensitive to drastic environmental changes (such as amphibians) survived and quickly recovered? Just food for thought. b. It cannot be a sauropod, because sauropods were not adapted to live in swamps or jungles, or submerge in water. Swamp-dwelling, semi-aquatic sauropods are a completely outdated idea. It’s true that the sauropod dinosaurs in the known fossil record appear to be ill-adapted for semi-aquatic life, let alone in jungles. Their fossilized trackways and skeletons show their feet would likely sink in such terrain. But why exactly should we assume that a hypothetical modern descendant of a sauropod is going to be exactly the same in its habits, habitat, and anatomical details as the sauropods from the fossil record? Aren’t there supposed to be 65 million years separating us from them? I’ll just throw this out there: if it takes “only” eight million years to get from land-dwelling mammals to whales, a sauropod will have no trouble adapting to changing environmental pressures. As long as they are still alive, animals adapt. Why dismiss a modified sauropod when known survivors of the Mesozoic (crocodilians, lizards, snakes, turtles, platypus, etc.) were able to adapt yet retain their overall morphology? c. Sauropods were too large and needed a tremendous amount of vegetation to nourish themselves. The most popular sauropods were indeed colossal life forms, some of them approaching a hundred tons in weight and growing over a hundred feet long. Argentinosaurus, Brachiosaurus, Camarasaurus, Dreadnoughtus…the mind boggles at the sizes they could reach, and the number of calories required to maintain such a body. However, the fossil record also includes dwarf sauropods like Europasaurus and Vulcanodon. Some of these dinosaurs reach the reported size of Mokele-mbembe, or even smaller. In fact, insular dwarfism is a well-documented phenomenon in animals when their range and resources are severely limited. Few people know that elephants smaller than cows once inhabited the island of Crete. Normally this happens when big animals are confined to a small island, but I wonder if the same thing can happen if the animal dwells in a dense jungle and has a specialized diet (Mokele-mbembe is reported to feed on several different types of leaves, but primarily eats the foliage and fruit of the Landolphia, or malombo vine). d. A breeding herd of sauropods would put quite a dent into the vegetation of the Congo Basin. Such creatures needed gigantic amounts of vegetation to feed themselves. Their eating alone would tell us they were there. It is true that a giant species of sauropod would be detected long before now, because of the damage such animals would do to a forest while grazing. But once again, we have to keep in mind the natives are not describing the titans prominently featured in museums and movies, like 70 foot Apatosaurs or 100 foot Argentinosaurs. They describe creatures with sauropod-like morphology that only get to about 30-35 feet in length. That’s half the length of many famous sauropods. And according to the square-cube law, if you shrank an Apatosaurus to half its size, it would weigh one eighth as much as it did originally. That means it will need far less vegetation to feed itself. We shouldn’t expect a small population of elephant-sized sauropods (or other herbivores) to carve a path of bare-earth devastation through their grazing territories. Certainly not in the quickly-regrowing jungles of the Congo Basin. If the animal does indeed exist outside of human imagination, I hope and pray we find and preserve this species before it goes extinct, especially since the Congo is liable to swallow up every trace of its existence if it dies out. Either way, perhaps I’m writing these abominably long blog posts in vain. I must account for that very real possibility at all times. Despite my suspicions and the case I’ve tried to carefully build in these posts, Mokele-mbembe might one day turn out to be a legend or a case of mistaken identity after all. The point I’m attempting to make here is that such a conclusion is currently not based on exhaustive exploration, the efforts of well-equipped search parties, or anything close to an airtight case assembled by those who argue against the creature’s existence. Therefore, much of the skepticism against Mokele-mbembe is based on false conclusions, and on false premises as well. My position is that there still much room on our world for creatures such as these. If they are there, God willing, someone will discover them soon. I hope I’m around to enjoy it, if and when that day comes. If this topic interests you, I highly encourage you to read and evaluate both sides, and reach your own conclusions. Here’s some resources to help you get started. Mokele Mbembe: Africa’s Last Dinosaur? A Living Dinosaur in the Congo? 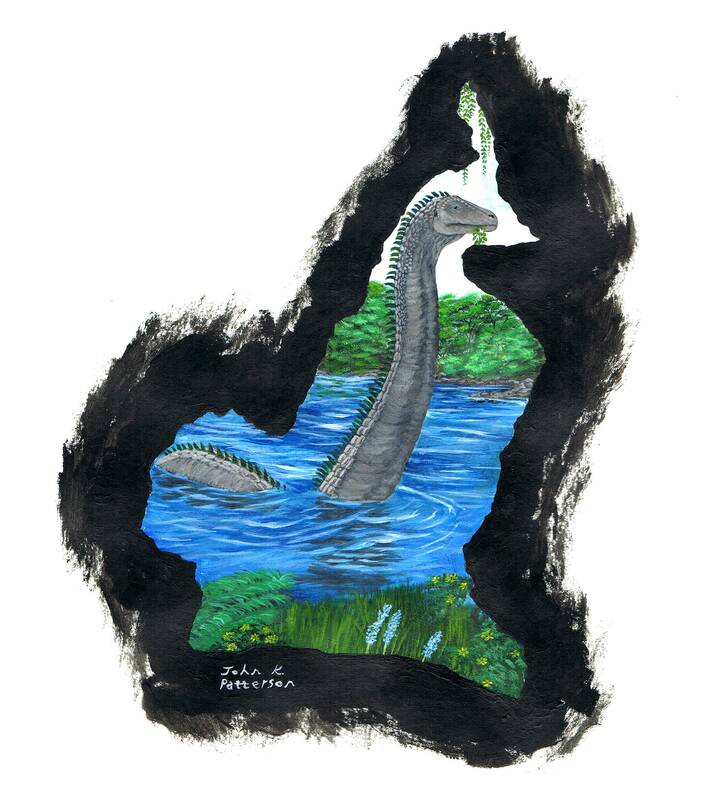 My previous post in this series details the reasons why there might be at least one so-called “monster” (well, unknown animal) in one of the most impenetrable regions of the world: Mokele-mbembe, in Central Africa. If it accomplished anything, however, all it did was open the door and display the Congo Basin as a good hiding spot for a large animal. Here, I hope to highlight the evidence that suggests this hiding spot indeed harbors an unknown species. Important Caveat: I will be upfront and admit this current presentation is less organized than I would like it to be. Certainly nothing compared to the tight argumentation provided by Max Hawthorne in the other post I published today. Sometimes I have been unable to track down the photographs I hoped to link to or include in this post, or was unable to reach some key people, but hopefully that will change very soon. If you’d like to learn more, I have a bibliography and weblinks at the end of this post. First will come the reports of physical traces, which help as tangible indications that something big, rare, and unknown to science resides in the Congo Basin. Secondly, there will be a brief recap of anecdotal evidence. Due to the difficulties mentioned in the first “Plausible Monster” post, I wouldn’t be surprised if a creature of unknown classification lives in the Congo Basin, yet visiting tourists/biologists/explorers have not gathered physical evidence. Nevertheless, there is one incident that stands out above others. The following information comes from William J. Gibbons’ books “Mokele-Mbembe: Mystery Beast of the Congo Basin” and “The Official Mokele-Mbembe Factbook” and from correspondence with my close friend Robert Mullin, who has been on three trips to Cameroon to attempt to gather information on this animal and search for it (in that country it’s known as La Kila Bembe, along with several other tribal names). As one expedition in 2004 (members included Brian Sass, Peter Beach, and local guide and hunter Pierre Sima) traveled by boat down the Dja River, they came across a little spit of land known locally as “Swamp Island.” There, the jungle’s normally dense shroud of overhanging vines had been stripped away by an herbivore, to a height of eighteen feet. 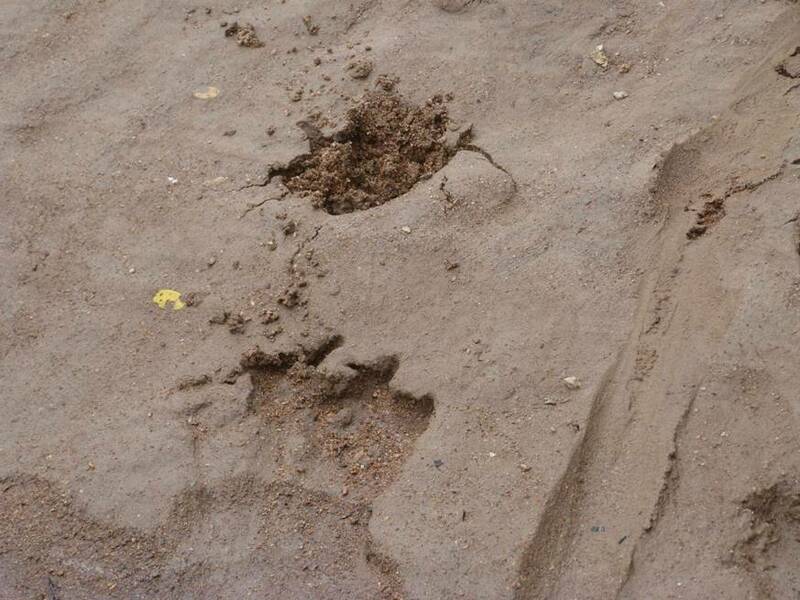 Large tracks were present on the ground, about the size of an elephant’s, but with prominent claws on the toes. Neither elephants nor hippos nor rhinos have these claws. According to the local guides they hired (whose livelihood, it’s worth pointing out, depends on their expertise at tracking animals and discerning their behavior from the traces they leave behind), the footprints came from two adult animals and a juvenile, who were moving side to side and grazing on the vines hanging above the bank. The toe of one of those footprints was made into a plaster cast, but unfortunately not enough plaster was available to cast the entire foot (I’ll be happy to post a picture of this cast and/or footprints, as soon as I can obtain one). From what I understand, the tracks bore a strong resemblance to these ones, found by Michel Ballot in 2013 in Cameroon, on “Bee Island.” Each track is about 12 inches in diameter, and does not bear a resemblance to anything known to live in Central Africa. I got the photo from here. Near the area of stripped vegetation were several caves in the ground. Caves like this, according to the natives in Congo and Cameroon, are used by Mokele-mbembes to estivate during the dry season (estivation is like hibernation when water is scarce, and is practiced by lungfish and certain frogs on the African savannah). A plaster cast of what looked like a claw mark was allegedly extracted from the surrounding mud by Peter Beach. If the natives desired to fool the Western explorers, this would seem an unnecessarily elaborate hoax. Perhaps they could fake stripped vines or a footprint or two or put some scratch marks on the walls of an already existing cave. But when the area can only be reached by canoe, to do all three may demand too much time and effort from the natives’ most immediate concern: hunting and gathering to feed their tribe. What if another large herbivore, already classified by science, could explain what was at the riverbank? Obviously a hippo or rhinoceros does not reach a grazing height of eighteen feet. Giraffes can, but they do not live in this part of Africa — the Congo Basin’s riverbanks might as well be quicksand to any large animal without wide feet to distribute its weight over the soft earth. The best candidate among known animals would be the forest elephant. I’d be willing to allow the possibility of a pair of forest elephants (of unusually great size) with a juvenile, rearing up on their hind legs, and plucking leaves at eighteen feet, if their trunks were extended. The main problem with this alternative is the prominent claws on the footprints, and the fact that the native guides didn’t just identify them as elephant tracks. Additionally, the guides were unaware of any elephant activity in the area. Given the details of what was found in this area, the simplest explanation appears to be this: the members of this expedition came across the grazing area of an unclassified species, and arguably the largest to live in the Congo Basin. Any “cryptid” can boast of stories and sightings, no matter how unlikely their existence or how bizarre/supernatural the creature. But the general pattern of Mokele-mbembe sightings does appear to match the pattern of seeing a rare animal. First, consider the people claiming they see Mokele-mbembe: native tribes that have little to no contact with each other (several of which have never seen a white man until recent times). Yet they all describe a creature with an elephantine body and four legs with stout digging claws, a small head, long neck and tail, dark and dull coloration, and iguana-like spines running along its vertebrae. Without a real animal to account for these sightings there would have to be an impressively extensive (and impressively hidden) conspiracy among the tribes to “get their story straight” to fool any explorers who ask them about unusual animals in the region. And given that many particular tribes go without contact for decades by white explorers with an interest in this long-necked animal, they would have to maintain this little conspiracy among their own people for years and years, without any gullible foreigners to string along. Human nature simply doesn’t work like that. There’s a surprising amount of biological plausibility in their description, as well. For example, the creature’s alleged vocalizations are deep and rumbling, said to be the product of a dewlap they can inflate like a bullfrog. Another example is their tail being used as a weapon to kill hippos or crocodiles straying into their territory. Some tribes in Congo do regard it as a spirit or god, with fantastic attributes (read Rory Nugent’s book Drums Along the Congo for a wealth of details), but in Cameroon the creature is almost always treated as natural, neither mythical nor supernatural. The alternative hypotheses to explain these facts (the natives are just messing with visitors; it’s only folklore; the natives are describing rhinos or giraffes; natives are misidentifying known animals, etc.) do not even come close to explaining the full picture that has been forming in the heart of Africa. Take the earlier post’s explanation of why the Congo Basin is still largely a blank space on the map, and couple it with the lines of evidence stated in this post (with more to come, I pray). An unclassified animal species, critically endangered and with reclusive habits, is likely to reside in the river systems and swamps of the Congo Basin. Alternative explanations have largely focused on trying to wave off or ridicule this hypothesis rather than seriously consider it. These will be dealt with in the final posts. In my last post I explained I’m generally no longer inclined to stand up and argue for the existence of Bigfoot, Chupacabra, or the Mongolian Death Worm. But if someone uses faulty argumentation against their existence, it’s still enough to make me cringe. Especially if they have a PhD and wrote an entire book that seems dedicated to this faulty reasoning, and published it under an academic press. A very exhaustively cited book on cryptozoology, Abominable Science is coauthored by Daniel Loxton (who seems like a very nice, fair-minded guy, and a very talented artist as well) and Donald Prothero, PhD (a paleontologist and professor at Pierce College in Woodland Hills, CA). It’s not so much the book I am commenting on here (though that may happen after I’ve read the whole thing…honestly, I’m a slow reader, so I don’t know when that’s going to happen). But given the Amazon description, its subtitle (Origins of the Yeti, Nessie, and Other Famous Cryptids), and what I had read of Prothero beforehand, I got suspicious that he’d already decided his conclusion before gathering research. Hence the quote about bulverism above. Long story short: I expressed my suspicions on Twitter a while back, and it seems Prothero was informed. And judging by a comment on one of his blog posts, he wasn’t very happy about the suspicion. Normally I wouldn’t respond to something like this, certainly not at length. But each sentence was either false or so poorly argued, I elected to craft a response anyway. Even if a skeptic is right on a particular subject, broken logic will never give him or her a solid basis on which to stand. In this case, it’s about time someone called him out for it. As a scientist, Prothero has a responsibility to use solid argumentation and make his case like a professional. Okay, so here’s the comment. In its entirety. “Clearly, this person hasn’t read the book, nor does he understand what we said. The genetic fallacy is only a fallacy if the origins story in question has no relevance to the truth or falsity of the argument being made. But the long story lines that Daniel teased out about the history of each of these cryptids–especially how their descriptions are inconsistent, how they are strongly influenced by cultural factors such as current movies, how they are full of hoaxes and bad data that the cryptozoologists NEVER expunge, and how they compile “lists of sightings” which are houses of cards, with nearly every one of them useless or questionable–is VERY relevant to the credibility of each cryptid. Oh dear, where to begin? First of all, I already admitted to not reading the book at the time. Check Twitter to see for yourself. I expressed concern that it was going to be a book with weak argumentation. I have a copy from the library at the moment. While some of its arguments are stronger than I worried, elsewhere those fears are being realized in spades. Duh. That’s what it means. Given the absence of a foundation of hard evidence, I’m inclined to agree with his overall conclusion. However, he then overestimates what the evidence gathered thus far actually tells us; then he dives to the bottom of the barrel, trying to make the proposal of unknown large animal species look like ridiculous, even dangerous pseudoscience. To do this, he scoops out cryptozoology’s familiar and well-established legacy of hoaxes, some genuinely preposterous ideas (Bigfoot being able to move to other dimensions, for instance), and the fact that humans can be made vulnerable to deception. To which Prothero himself, of course, is blessedly immune. The starting assumption in the book and his worldview appears to be that these sightings are most emphatically not caused by unclassified species of animals (even though that sounds like a perfectly modest and reasonable possibility, at least for some cryptids), therefore the explanation must lie in psychology and old-fashioned gullibility, and this is sufficient to explain pretty much the entirety of cryptozoology. Welcome back to the genetic fallacy, Professor. You have provided a textbook example of it, in more ways than one. Oh? Says who? Is it scientifically impossible that there is an ape of unknown classification in the Himalayas? Is it impossible that a large something-or-other is lurking in the cloudy waters of Loch Ness? Of course not! It’s unlikely, but no possibility is demolished. Why take the position that it’s impossible? “Says the fossil record,” which Prothero seems to believe is overall complete with no big surprises awaiting us. Never mind that they keep finding a new species of dinosaur every couple of months. Many of which are totally unexpected. Not to mention the numerous other newly identified animal and plant species routinely recovered from the field or dusted off in museum archives. Paleontology is a great scientific endeavor, but when they can’t even get the nonexistence of Brontosaurus right, you’d be wise to learn to never say never. “Says biology,” because of course we’ve learned every single impact an organism can have on its environment. We can instantly detect the impact a species has when something is amiss. Oh, except for the 125,000 extra gorillas found in the Congo in 2007. And the new species we discover all the time on submarine dives to the darkest corners of our oceans. Hmm, maybe we don’t have all the evidence in yet? “Says geology” because…well, I’m not sure what he means. It seems paleontology would have more to say about animals than would general geology. It was kind of a broad brush to start with. Then he throws out a red herring that implies anyone who says he commits the genetic fallacy is on the wrong side of the origins fence. As if no one who accepts evolution could possibly see anything wrong with his logic, or as if this has anything to do with the veracity of his claims. Basically, he got caught committing the genetic fallacy. But rather than owning up to it or beefing up his arguments or retracting them, he opted to flaunt his dubious line of reasoning in everyone’s face, and yell that he’s totally justified in doing so. This is such an insult to logic that Mister Spock would do a “Live Long and Prosper” facepalm. Skeptics, you’ll do yourselves and others a huge favor if you can please get your act together. UPDATE, APRIL 29, 2015: Regarding Prothero’s stance that the fossil record doesn’t hold animals that can be properly called “cryptids,” I’d like to point out yet another unexpected discovery reported today: a pigeon-sized dinosaur in China, with elongated arms and fingers, and membranes underneath that strongly resemble the wings of a bat. That’s right. If this fossil is genuine, they basically discovered a small dragon. You’re welcome. I will be upfront and say I lack training in microbiology and biochemistry, and this post is intended to be a big-picture pondering on the subject, rather than a paper for peer review. So feel free to take what I write with a five pound bag of salt. Abiogenesis is the notion that biological life can coalesce out of molecules. In this scenario, no more than the right circumstances and chemicals are required, and they can be acted upon by natural laws to bring about a complex self-replicating molecule that could eventually give rise to what we would normally call a cell. It is also something that has never been replicated in the laboratory. The actual results behind the optimistic rhetoric of life’s “building blocks” (amino acids, etc.) being generated in the laboratory pales in comparison to our increased understanding of what would be required to be present in even the simplest conceivable cell, one much simpler than the ones we have yet detected under a microscope. And yet abiogenesis is taken for granted as having occurred at some point in the past, whether on Earth or elsewhere. Some time ago on Facebook, I had a couple of debates with natural history illustrator and paleoartist Julius Csotonyi, who is also very well-trained in microbiology. My position was (and is) that decades of experimentation give us excellent reason to harshly criticize the assumption of abiogenesis, and even discard it. He pointed me to many, many papers on the subject and the basic argument put forward was, “We’re working on it, and are getting more answers. We just need more time to figure out how [not if] abiogenesis happened.” I would point out more problems after looking over the arguments given (and the papers I had time to peruse), and more papers would be thrown down to trip me up. All in the name of benevolently “educating” me, you understand. We all know that either one of those showing up in a test tube would be the biggest biochemical breakthrough in this century and would instantly flood journals and social media both. In the meantime, the gap between laboratory results and the requirements to generate a cell should be shrinking. If that gap expands, it’s a good bet that abiogenesis is a faulty hypothesis, and to hold it as the clear explanation for life’s origin is to engage in pseudoscience. As far as I can tell, a handful of possible but hotly debated answers have been uncovered, but that handful is dwarfed by the mountains of newly uncovered questions and obstacles. The gap between lab results and the requirements to generate even the simplest cell seems to grow every year. Still, is there some chance that the stated results of abiogenesis experiments give any cause for excitement at someday creating a cell, or at least a self-replicating complex molecule? Let us imagine a compulsive gambler who has racked up several million dollars in debt. Hoping to win it back, he returns to the tables, and manages to win a few hundred bucks. But he has not come close to paying it off. He’s even lost enough times, in his renewed efforts, to add another million to the bill. Would any hope or optimism on the gambler’s part be warranted? I admire the dogged persistence for a desired result. What disappoints and frustrates me is the double header of assuming the process must be possible, combined with a climate of hubris in academia, which perceives anyone who says abiogenesis cannot happen to be uneducated, or unwilling to consider it — perhaps out of some nefarious religious motivation. It would be more accurate (and more gracious) to say that those more removed from the assumption that life can start by natural means may, ironically, be more observant and more willing to follow where the data points. Not only have the predictions of abiogenesis failed (or “been revised” to put it more politely), but the hurdles of statistics and chemistry have added to the problems with even the simplest conceivable cell assembling from a state without biological life. This is much more than scientific inquiry whittling down explanations and refining the hypothesis. The debt does not merely still stand; it has been augmented. The insistence of the True Believer combines with the momentum of grant money and an assumption that is less warranted than ever, that life “must have spontaneously generated” by natural process (the words of Stephen Hawking). Thus today’s model of Spontaneous Generation spins its wheels, all the while demanding exclusivity in laboratory and classroom alike. My request remains. A cell or self-replicating complex molecule will do. Neither a computer simulation of a cell nor the laughably mislabeled “protocells” so far generated will satisfy the demand for abiogenesis to be scientifically tenable. The changeable rules of “proper” science may cling to abiogenesis in the teeth of the evidence and hang a no-creators-allowed sign on its clubhouse door. But, if such a creator happens to exist, the necessity of such a being’s handiwork may insist on giving Him a hearing anyway.